The security predicaments in the Middle East traverse long distances. In the echo chamber of new media platforms, local threats can become global obsessions. Recently, two non-state armed actors namely the Syrian Kurdish participants under the Democratic Union Party (PYD) and the so-called Islamic State (IS) have grabbed the headlines. How did a local Kurdish war draw global attention and international support? How can the war against IS and Kurdish political identity be connected? Our study examines how visual artefacts (images of security) are put to use in regional and global platforms so as to establish wider recognition, legitimacy and affect on external audiences. It shows how Kurdish identity markers are globally disseminated and visually mediated. It argues that there has been a new Kurdish geopolitical space, one that is enabled by a global regime of imagination. We explore the latter by examining the attendant meaning-making strategies transmitted through mediascapes (i.e., globalized circulation of select maps, drawings, photographs or portraits). 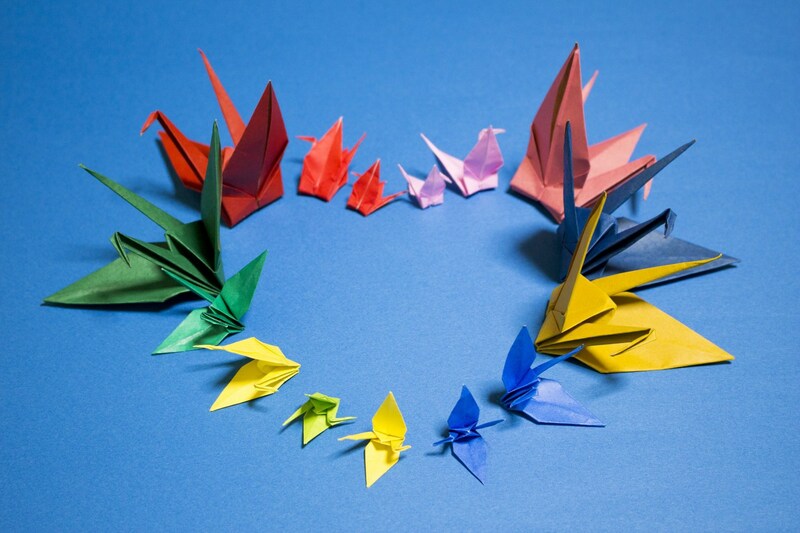 We show that the global war against the IS has been an instance of war-making that involved not only strategic interactions but also discursive and aesthetic signification. We illustrate our arguments in three case studies. The first case examines the politics of narrative reconstructions of the siege by IS of a small Kurdish city in Syria in 2014. 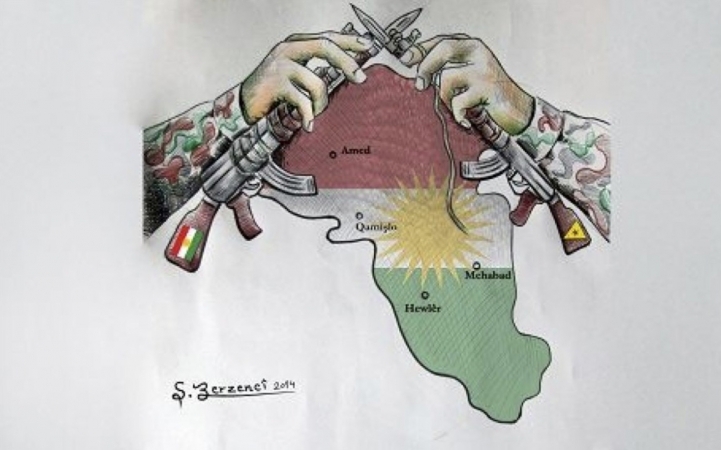 The second explores a symbolic-pictorial appropriation of an imagined Kurdish homeland (the pictogram shown in the analysis of the cartoon drawing) as part of a meaning-making strategy to generate a united Kurdish front in the region. The third investigates the politics of gender and visual affect generated around the Kurdish female fighter photos. In particular, we find that certain representations of the Kurdish fighters waging war against IS through narratives of ‘secular resistance’ and gendered visual artefacts aimed to construct a new ‘agency’ for international, regional and local audiences who could ‘see themselves’ in these collective representations. Such verbal-visual representations in turn helped to make a threat or distant war (against IS) proximate, familiar and urgent for otherwise disinterested audiences. The representations of Kurdish female fighters, Yekîneyên Parastina Gel (YPG) in select modalities (of photographs and color) sought to project a secular subjectivity and civility in daily settings as opposed to the sacrosanct identity and brutality of IS fighters. The female warriors were largely sensationalized by the local and international platforms so much so that even some global fashion companies such as H&M, attempted to usurp the YPJ’s warring experience by designing outfits based upon the Kurdish female military uniforms. The gendered projections were instrumental in the perception of Syrian Kurds as a secular, self-ruled society that allowed its women to participate in government and fight alongside their men. For the western gaze, seeing the images of women of their ilk in the battlegrounds of a region-often portrayed as medieval, oppressive or backward had historically been eye-catching particularly since the case of French efforts to modernize Algerian women expected to take up a ‘functional capital role’. Also, the Syrian Kurdish PYD’s struggle for recognition in northern Syria was readily granted and its war against IS was supported by the international society and western states even though the PYD’s sister organization, the PKK, has been globally designated as a terrorist organization. Our investigation into the politics of image, gender and insecurity shows that the PYD’s struggle for territorial gains in Northern Syria in particular and its war against IS in general turned into a gendered and globalized war fought with armory of verbal-visual artefacts. Such a wide-scale re-imagination helps to elevate the Kurdish ethno-political identity in the face of territorial and demographic complexities and predicaments within Syria, Turkey and Iraq. We note that reinforcing a secular subjectivity against the radical religious identity in the Middle East also helped to overcome the initial western inertia in the fight against IS. In other words, the newfound regional-global interest and international society’s political support for the Kurds stem in part from and interact directly with the projected narratives and representations of the secular fighting the pre-modern fanaticism. Hence the Kurdish struggle for recognition took a globalized turn reshaping Kurds’ identity and subsequent geopolitical imagination. Specifically, we argue that the global war against IS has helped the reconstruction of Kurdish ethno-political subjectivity and geopolitical imagination. The war strengthened an important marker in the reorganization and relocation of non-state Kurdish armed actors in the regional geopolitical competition. The internationalization of the Kurdish struggle through gendered and aesthetic lens helped to bring widespread international political and military support for the Kurdish forces. Therefore, the global opinion-making pertaining to the Syrian Kurds and IS were temporarily and spatially ‘made’ through practices of visual, speech and textual representations. The latter in turn reshaped the Kurdish geopolitical imagination, western secular civility and regional security. Hence we are able so argue that so long as the security threats from IS or its ilk are visually and verbally made “proximate, familiar and urgent” in world politics, international support for the Kurdish non-state armed actors in the Middle East is likely to increase. Crucially, the politics of representations help the western viewers to reconsider and even strip the Kurdish non-state armed actor’s ethno-political markers (that is, Kurdish-Marxist militarized nationalism) so as to entertain an affective relationship with them. Affection, being and action (for example, the responsibility to side with and protect women/Kurds against the IS) were reciprocally constructed. This was thanks to a select set of images that depicted the Kurdish female fighters in secular, civilized daily routines rather than in war-making roles or activities. Our article, ‘Rethinking Kurdish geopolitical space: the politics of image, insecurity and gender’ supports three theoretical conclusions regarding the visual turn in international relations. First, it is theoretically fruitful to study visual artefacts as situated in ideological-hegemonic power relations and concomitant social-historical contexts, which are amenable to investigation. In particular, certain verbal and visual modes of communication are productive of identities that may influence public opinion and inform foreign policy choices. Second, this study highlights the politics of verbal and visual signs for war-making beyond the realm of strategic rationality. In other words, our verbal-visual focus is to show that the mobilization of said global support was not simply emanating from a geostrategic necessity. It helps to explain how the verbal (discourses of alterity) and the visual (immediacy of globally circulated images or photographs) can help to construct new (gendered) subject positions. It seems, therefore, necessary to put the analytical foci on the politics of visuals and gender to grasp how states and non-state actors can frame their interventions so as to macro-securitize the corresponding political gains and positions. The visual strategies discussed in our study can potentially serve as transition belts that can link individual, state and systemic levels of analysis in IR theory (recall it was largely by way of verbal and visual representations that a local warfare in northern Syria was globalized as evinced in the case of the Kobane siege in particular and the war against IS in general). Thirdly, when studying images in daily “micropolitical” settings, (visual) security studies should address other, more pressing political questions as to how hegemonic interpretations of world politics are constructed and what kind of power relations are produced thereof. As our study showcases, insights from the conceptual and theoretical frameworks from other academic disciplines-namely visual and cultural semiotics-can overcome some of the methodological difficulties associated with studying the effects of visuals in world politics. Visual semiotics offers some important venues for understanding how images can “speak” security. It also provides an alternative lens with which one can account for the hegemonic significations of ‘the people’, be it the Kurds or the West. Such alternative approaches can equip IR with new conceptual and analytical frameworks to study the role of a plethora of visual artefacts in world politics so as to address, inter alia, justification of security policy and war. Fanon, Frantz. A dying colonialism (New York: Grove Press, 1965): 38. Tuncay Kardaş is Associate Professor of International Politics and the head of Department of Middle East Studies in the Middle East Institute, Sakarya University. He holds an MsEcon degree in Security Studies and eraned his PhD in International Politics, both from Aberystwyth University in Wales. His main research areas are critical security studies, visual security studies, semiotics, non-state armed actors and Kurdish studies. His recent articles appeared in Middle East Critique and Turkish Studies. Kardaş co-edited two books: Exploring Samuel Huntington’s Faultlines, from Al-Andalus to Virtual Ummah (Oxford University Press, 2009) and Non-State Armed Actors in the Middle East (Palgrave, 2018). Murat Yesiltaş earned his PhD at the Department of Political Science and International Relations at Marmara University in 2012. He is an Associate Professor in the Middle East Institute of Sakarya University. His current research is on critical geopolitics, ethnic/religious radicalization, geopolitics of non-state conflicts, terrorism and the Kurdish affairs. Yesiltaş is the author of Türkiye’de Ordu ve Jeopolitik Zihniyet (Geopolitical mentality and the military in Turkey, Kadim, 2016), and co-edited Türkiye Dünyanın Neresinde? Hayali Coğrafyalar Çarpışan Anlatılar (Where is Turkey located? Imagined geographies, competing narratives, Koc University Press, 2015) and Non-State Armed Actors in the Middle East (Palgrave, 2018).